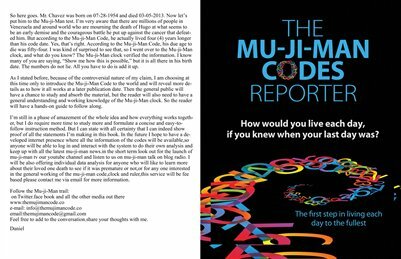 The mu-ji-man codes reporter: (Pete Seeger) | 1919-2014| age 95| coded for 100 yrs. The mu-ji-man codes will like to extend sincere condolences to the family and friends of Pete Seeger,who departed earlier this week to continue his journey into eternity,he was 95 years old.Pete was a prolific songwriter and has touched the lives of millions over the past few decades,he will be greatly missed by his family and legions of adoring fans.Based on the information encoded into his birth date and birth name he was actually coded to live until the age of 100 so he died 5 years before his coded age. I was recently asked about the 27 club and how does the mu-ji-man codes stack up to the fact that all these famous musical artists died at the age of 27.well quite naturally I was intrigued and did what is natural for me ,I got out my pen ,paper and calculator and began a study of this club which I had no knowledge about.so like anyone else in the world will do when they want to find some information on any given subject ,I googled the words 27 club.after spending a few hours of reading up on the 27 club I became more curious myself as to what the mu-ji-man codes will reveal about this club of famous celebrities who all died at the age of 27. I was stunned to see the quantity of members of this club and could not wait to begin my mu-ji-man codes analysis to see if they were all coded to die at age 27.Although the list is made up of over fifty members and counting the most famous members of the club are Jimmy Hendricks,Janis Joplin,Jim Morrison,Kurt Cobain,Brian Jones and Amy Winehouse.I am still in the process of analyzing all the data for all members of the club and will have a full report on my findings,however today I can report that the data contained within the birth dates and birth names of these individuals is quite stunning.May be its all co incidence but when the same pieces of information repeats itself for such a diverse group of people,I think that one must conclude that it cant all be coincidence. Pardon me for leaving you hanging but once I have completed my analysis,I will report back with the details. Happy Birthday DR. King and happy Martin Luther King’s day to all here at home in America and around the world. Dr king was an extra ordinary human being and he was and still is a shining example of what all human beings should aspire to be,he was gifted early in life with the universal knowledge of oneness,he embraced that knowledge and dedicated himself to teach,preach,and live it to the best of his ability just like the other sages before him. Based on his mu-ji-man codes calculations 39 was a significant marker and we know the meaning of that number,and we can only imagine what this country will look like today if he was not cut down by that fatal bullet at the age of 39,forty six years ago,death was no stranger to Dr.King and he knew what his assignment was,his only worry was ,will he have the needed time to touch the necessary amount of hearts to fulfill his mission,and today as we look at the violent state of affairs in the united states and around the world,we will have to conclude that he fell short in that respect,however just the mere fact that there is an African American family occupying the white house today and a non white face is the symbol of the most powerful man in the world and controls the keys to human existence ,tells us that Dr. king succeeded in his over all mission of moving the needle in the right direction,to achieving a more just and tolerant society. In conclusion I will like to remind us all both here at home in, these united states as well as around the world,that the only message we must hold near and dear to our hearts from great men like Dr. Martin Luther King and all the others who came before him and those that will follow him, is the message of universal oneness,this knowledge is known to all but its not taught by the great universities and colleges ,so from time to time the universal master dispatches one of his brightest pupils to remind us humans on its presence,and to show us by example that it is possible to achieve and maintain that oneness by,simply removing the cancerous habits of h-a-g-e-e-l.
By striving each day to become H-A-G-E-E-L free,we will transform ourselves back to our original form and return our souls to the collective oneness of the universe,by so doing we will bring into being the peaceful,just,and non violent society we all want and wish for.For centuries the messangers names and faces were different but the message has never changed,so lets all join the ranks of the great sages and dedicate ourselves to becoming H-A-G-E-E-L FREE ,try it you will see.Because in a h-a-g-e-e-l free society there is no need to march for your god given human and civil rights,no need for guns and bullets,no need for a no shots fired day,no need for wars and invasions,no need for hunger,no need to feel superior,better or different,no need for possesions. The mu-ji-man codes will like to extend condolences to the family and friends of mr. David Madden who died on January 16,2014. Mr madden was a well known actor and played the role of Reuben Kincaid on the Partridge Family a popular sitcom from the 1970′s as well as other hit shows. Based on the information encoded into his birth date he was coded to die at the age of 79,he died in hid 83rd year so he lived plus 4 years beyond his coded age.May he have peace and blessings on his continued journey. The mu-ji-man codes will like to extend condolences to the family and friends of mr.Ariel Sharon,former prime minister of Israel who died on January 11,2014.Mr Sharon was in a coma for several years he was 85 years old ,six weeks short of his 86th birthday. During his life time he was a man of many talents and held many positions in the Israeli military and isreali politics, he was loved by many and hated by many and will be remembered fondly by some and as a tyrant by others,however its my personal opinion that as he approached the waning years of his life,he began to realize that being h-a-g-e-e-l free was the way to be and before his stroke he began to make the transition from warrior to peace maker. Based on the data encoded into his birth he was coded to live to the age of 93,he died about 7 years short of his coded age. The mu-ji-man codes will like to extend condolences to the family and friends of Phil Everly of the Everly Brothers musical group.He will be greatly missed by his legions of fans from his decades as a successful musician. According to the data encoded into his birth date he was coded to die at the age of 78 so he died three(3)years before his coded age. 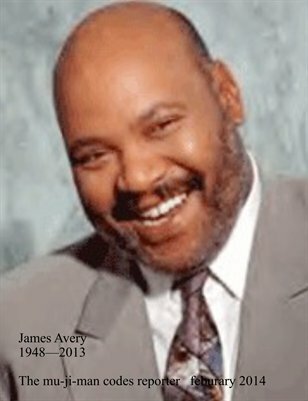 The mu-ji-man codes will like to extend condolences to the family and friends of James Avery aka uncle phil to many including myself.He was truly a fine actor and filled up whatever space he occupied,he will be dearly missed by his legions of tv and movie fans expecially so many who grew up with him on the hit tv show fresh prince of bel air also starring wil smith. 69 so he died 4 years before his coded age. We all wish uncle phil gods speed on this phase of his journey.